Elafonissos (the name means in Greek ‘’the island of the deer’’) is located at the south-eastern point of the Peloponnese with acreage of ​​19 square kilometres and is only 570 metres away from the opposite Peloponnesian coast of Punta. The population of the island is just a few hundred inhabitants in winter but during the summer this number gets doubled. Also, the island is an attraction for thousands of tourists and the peak months, July and August, the overnight stays are over than 5.000 while the transport by car daily reaches the 1.600. 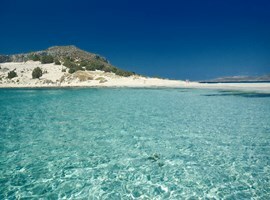 If you want to visit Elafonissos for your holidays, you have to know that there is a rural treatment room on the island. In Neapoli (in Lakonia) there is a Health Centre and the nearest hospital is in the city of Sparti, in the Peloponnesian coast. Also, in Elafonissos there is a pharmacy and a full service laundry, and during the summer months work many restaurants, fast foods and beach bars. In additional you can find an internet café, bakeries, super and mini market and finally in the village of Elafonissos work stores with traditional products and sweets, handicraft products and a few gift shops. 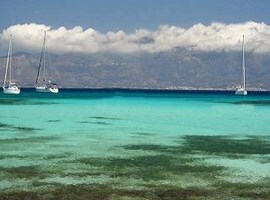 The sea areas in Pavlopetri and Hamokelo are ideal for wind surfing and kite-surfing. Also, the island of Elafonissos is a paradise for fishing as in its waters lives the entire sea world of the rich Aegean Sea. 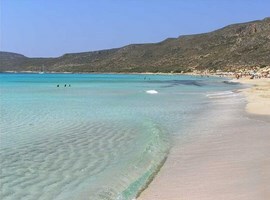 It’s a really large and charming beach in the southern part of the island, across from the island of Kythira. There someone can admire the amazing colours of the emerald sea and the sand with its golden-white colour. 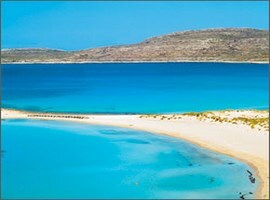 Also, there are sand dunes, unique in the Greek territory which they reach the extreme height of the 10 metres! This beach is a place of outstanding flora with lilies of the sea, and beautiful cades. The beach in August is filled with thousands of white lilies of the sea. It’s a beach in the homonymous cove on the western side of the island. The only shelter against the southern and south-western winds. 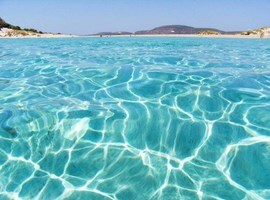 It has a white sandy beach and the most beautiful sea colour you have ever seen. 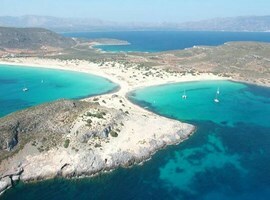 The Lefki beach has started to be more famous the recent years thanks to its majestic beauty. Also, the cove is full of the rare, very beautiful and very smart fishes ‘’katsoula’’. It’s the only beach in island which has pebbles and no sand. 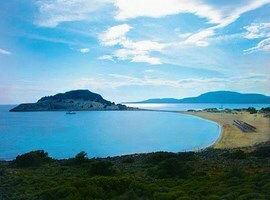 It’s very well hidden behind the little island of Aglyftis at the most western part of Elafonissos. Aglyftis is a small beach and the only way to access it is after hiking from the near shelter. It’s a beautiful sandy beach on the opposite coast of the Peloponnese, on the western edge of the host port of the village Viglafia where the ferries for Elafonissos leave. In the recent years the Akra Pountas moved internally with dozens of steps leading to a large reduction of the length of the beach (and substantially Elafonissos, with this large movement of sand is found to be 570m. from Peloponnese when a few years ago the distance was about 350-400m. This is a wonderful beach with crystal blue shallow waters, ideal for families with kids. In the area there is the immersed town of Pavlopetri and the immersed cart roads from the past. It’s a big sandy beach at the western part of the island which is protected by the many islets while from the internal side is protected by a wall of cedars. The beach is the home for thousands of flowers Sempre Viva and for beautiful plants in the spring until June. Here the seabed plays with the colours and the underwater flora. There are rich fishing grounds that present a wide variety of fish species. This is a gorge of unique beauty. A visit there can lead you to the secrets of the underworld. There are two alternative routes available which both start from the town of Neapoli. In the first route, someone can go up and then to descend to the village of Kastania on the back side of Vatika. From the village you can follow the signs to the cave. In the other route, we go up from Neapoli to Lachi and just a little before the village we go to the left direct to the settlement of Paradisi. A stop under the shadow of the big plane trees is a great opportunity to have a light meal, drink cool water and enjoy the dew. You can access the Petrified Forest driving up from Neapoli to the village of Agios Nikolaos, and then continue across the back road to Agia Marina. The access by sea is much easier as the forest is inside the cove of the homonymous village. Amazing colours of the water and two stunning sandy beaches combine the rare and unique landscape of the Petrified Forest. To anchor is quite easy and also hewed stairs will help you to reach your destination. In the village of Pavlopetri there is the lake of Strongyli which is connected with the sea and the beach of Pavlopetri. In this place there are a lot of chambered ancient tombs, hewn stairs, and ancient graves on the opposite homonymous islet. Submerged a few meters below the surface lies in a short distance from the island, the ancient city of Voion which is described from Pausanias in its writing Laconic since the 2nd century BC. An extremely strong earthquake caused the phenomenon of the sand-making of the coastal ground, converting a huge area into quicksand. The result was the cut off the peninsula land Onou Gnathos and the creation of the today island of Elafonissos.